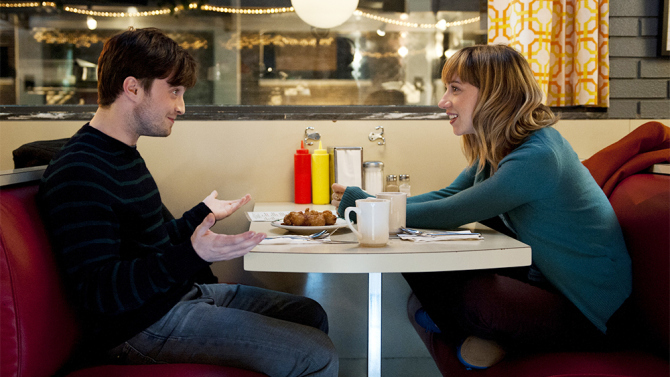 I was very excited to see this new romantic comedy ‘What If‘, starring Daniel Radcliffe, Zoe Kazan, and Adam Driver. I even might have mentioned that it had one of the funniest trailers I had seen in a while, which you can see below. ‘What If‘ answers or at least tries to answer that age old question, “Can a man and a woman just be friends?” This concept is definitely not new and has been seen many times before, specifically in the hit comedy ‘When Harry Met Sally‘, which starred a young Billy Crystal and Meg Ryan. This rom-com does nothing new and is a generic paint-by-the-numbers romantic comedy. However, the script, characters, and great performances by the impressive actors, casts a magic and charming spell on its audience, that you’ll leave the theater mostly satisfied, even though Radcliffe has no wand in this film. But the usual tropes and jokes of a romantic comedy fill ‘What If‘ up, which was formally titled ‘The F Word‘. Radcliffe plays a young man named Wallace, who we meet sitting on top of his sister’s house in Canada, gazing up at the universe, deciding on whether or not to delete the last message from an ex girlfriend from over a year ago. He does indeed delete the contact and the message, thus signifying that he is finally ready to move on with his life. He finally steps out and attends a party, thrown by his best bud Allan (Adam Driver), where he meets Chantry (Zoe Kazan), as they discuss all sorts of fun things at the party and immediately hit it off. He walks her home, and while she is getting his number to hang out again, she nonchalantly mentions that she has a boyfriend. But Wallace, being the stand up nice guy he is, seems okay with it and the two start to hang out strictly as plutonic friends. Chantry even invites Wallace over for dinner to meet her boyfriend Ben (Rafe Spall), a young handsome man who works for the United Nations. Ben’s job sends him out of the country for six months, leaving Chantry and Wallace to hang out more often than before, thus growing closer to one another, but never acknowledging or acting on their attraction for one another. But as we’ve seen many times before, someone has to tell the other how they feel at some point, and we do see the consequences of that. In an awkward but genuine scene when Allan leaves Wallace and Chantry alone on the beach without clothes and vehicle, they are forced to sleep in the same sleeping bag. In what Allan though would lead to them finally talking about their feelings for one another, it ended up in their first fight. And we get to see all sides of a friendship, whether it be the highs or the lows. Radcliffe is amazing here as Wallace, as he gives it his all as an emotional mess from a bad breakup, but trying to ease into the world of love and dating again. He plays it very well. Kazan as always is great, and the two have great emotional chemistry, but the physical chemistry just wasn’t there. 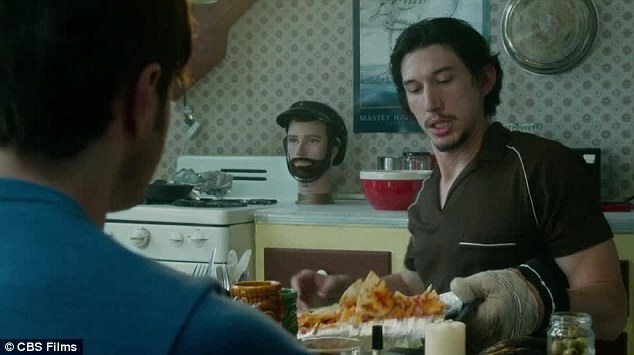 And of course Adam Driver is perfect as he always is, and is similar to his character on HBO’s ‘Girls‘. I only wish that the film would have ended 10 minutes earlier and didn’t have the perfect cookie cutter ending, because while this romantic comedy had the all of the ingredients for a run-of-the-mill rom-com, I had hoped it would have taken a better approach to its ending, rather than hitting us over the head with a bag of hammers to make us feel happy. That being said, ‘What If‘ is still enjoyable and packs quite a few laughs. I just don’t think it’s going to be remembered as the great romantic comedy of the year. You Must Watch The ‘What If’ Trailer!! Film Review: ‘Swiss Army Man’! Film Review: ‘The Big Short’! This entry was posted on Thursday, August 7th, 2014 at 8:46 am	and is filed under Film, News. You can follow any responses to this entry through the RSS 2.0 feed. You can skip to the end and leave a response. Pinging is currently not allowed. « Film Review: ‘Teenage Mutant Ninja Turtles’!! Buddy, for your own good you gotta let this go.